Party snacks. Party appetizers. They are my jam. I am unashamedly admitting to you right now that I’m the gal who hovers around the food table at a party, forgoing socializing and general party fun, until allllll the mini sausage rolls have disappeared. Because when else do you get an opportunity to eat mini sausage rolls guys? I never make them, never have any in the freezer to heat up for a quick lunch. They’re strictly a party treat. Actually before we go any further I should stop with the sausage roll talk because this isn’t even a sausage roll recipe. 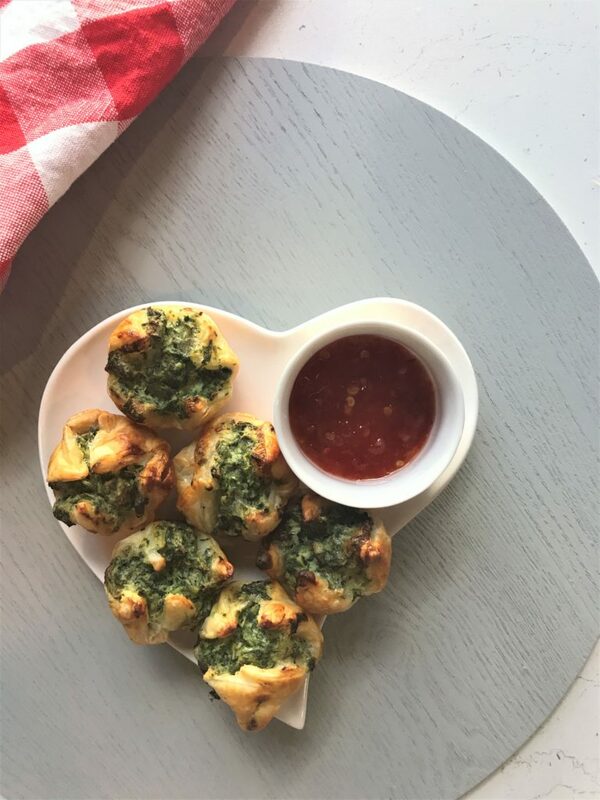 It’s a spinach and ricotta puff recipe. 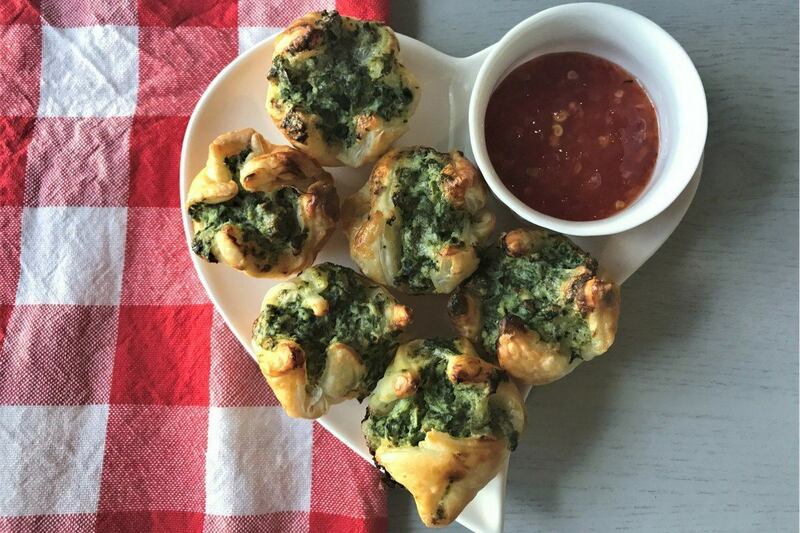 Specifically the tastiest dern spinach ricotta puffs you ever will pop into your mouth. 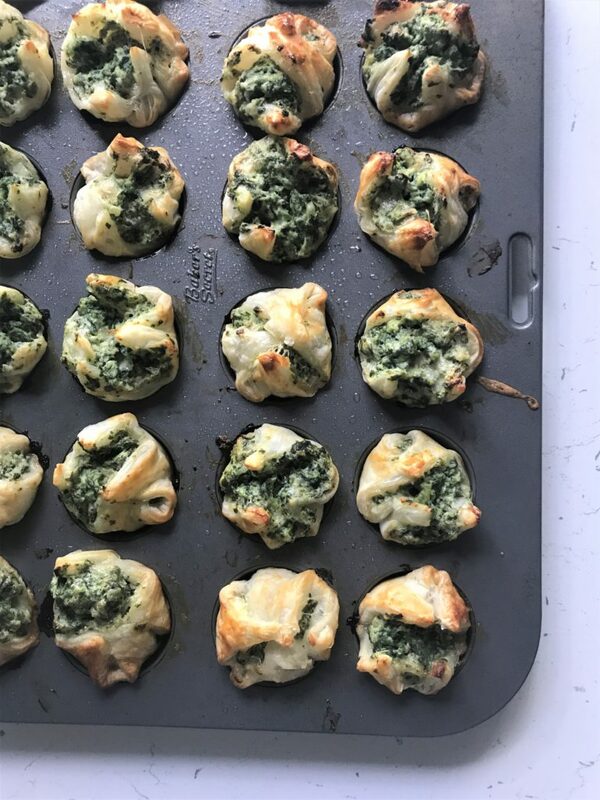 I made these bite-sized little brothers of the spinach and cheese triangle for Steph’s engagement party (remember her super cute proposal story I posted a few weeks ago?). She’s marrying into a gorgeous big Italian family, and the good news is my puffs went down a treat. So we can call them Italian-approved and move on. 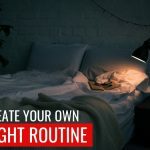 I wrote this post sitting across from Tahlia (who said she was writing too, but was mostly just downloading IQS recipes. Busted!) and I was trying to explain why these puffs are important to me. You see, I love a good spinach and ricotta puff. The problem is, the majority of puffs that I’ve tasted out there are a little lacklustre. Bland. Dry. Too much ricotta. Over-cooked spinach. Not enough pastry to filling ratio. I think I may have lost Tahlia’s attention to a balsamic rice recipe at some point as I listed off these common puff issues, but hey. 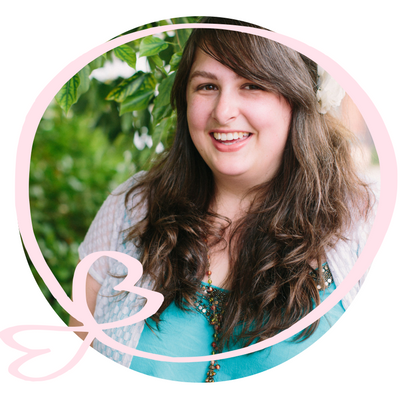 As a puff purist, these are things that are significant to me, and problems I wanted to avoid when I tackled the puffs for myself. Well you can rejoice, cheese and spinach lovers, because with a bit of testing and tweaking, I did it! 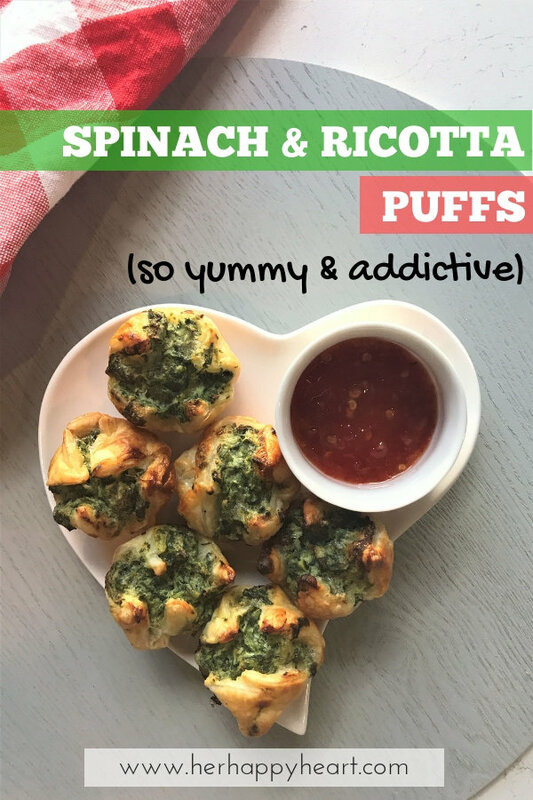 In my opinion, these spinach ricotta puffs tick all the right boxes. They’re bite-sized, crispy little pockets of flavour, and carnivores and vegetarians alike will enjoy them. I mean I’m not going to lie; they look rustic as hell. I tried and failed to assemble them using this technique. Now those are some pretty puffs. Food does not need to be beautiful to taste awesome. Move over, sausage rolls. 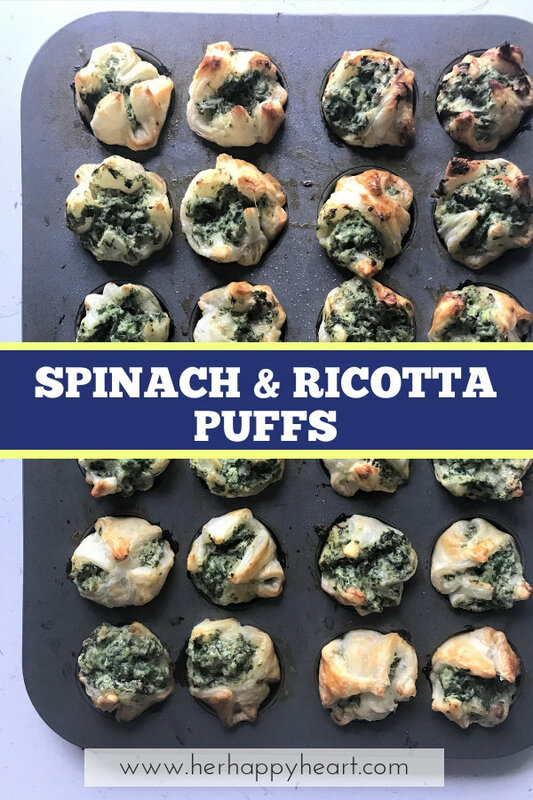 Spinach and ricotta puffs are coming for ya. Preheat oven to 180ºC. Spray non-stick mini muffin trays lightly with olive oil. Using a steamer (or a metal colander over a pot of boiling water), steam the spinach until slightly wilted (about 5 minutes). Rinse under cold water. 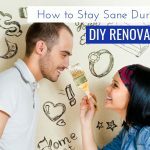 Using hands, squeeze moisture out. Place spinach, ricotta, spring onions, whole egg, cheeses, oregano, salt, pepper and chilli flakes (if using) in food processor. Pulse until finely chopped and combined (avoid over-pulsing, or it will lose its texture). Slice a sheet of puff pastry into 16 even squares. Place each pastry square in mini-muffin tray, pressing into the bottom and ensuring corners stick out. 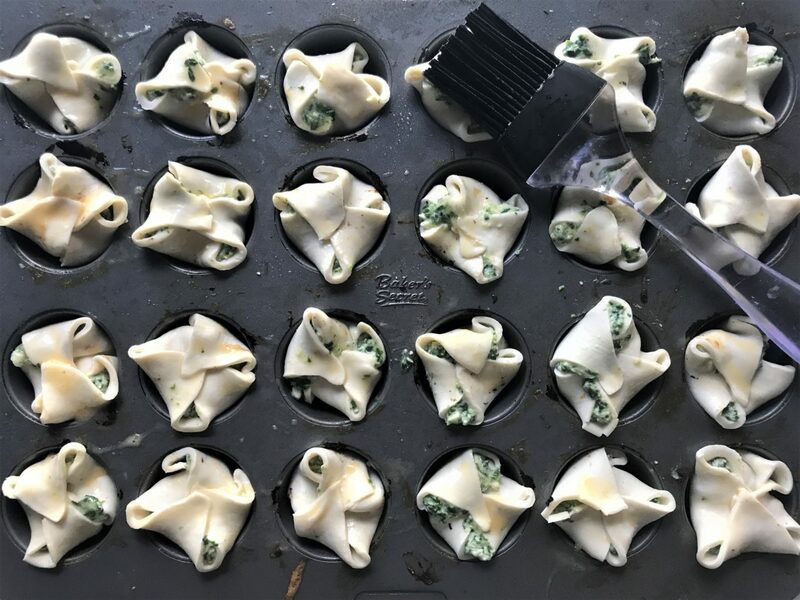 Add a teaspoon of spinach and ricotta mixture to each pastry base. Carefully fold corners in toward middle of each puff, loosely covering the filling. Brush with lightly beaten egg. Bake 15-20 minutes or until golden and cooked through. Repeat with remaining pastry and filling. Best served warm but also taste great cold.